The results for each candidate standing in all 73 seats in Greater London are available as Excel and CSV files. The data is also presented as an interactive map (requires Adobe Flash Player). 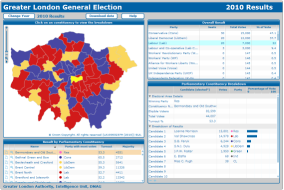 The map also presents election results from 2005, though it is important to note there have been significant boundary changes across London, which affect direct comparisons. The results presented here include turnout, majority and percentage of vote for each candidate that stood in the election that took place on 6 May 2010. A summary of demographic and related data for each Westminster Parliamentary constituency in Greater London can be found in the GLA's recent Constituency Profiles.